Sam Houston State University will celebrate “Hope Year” and support the American Cancer Society with an all-night walk at Bowers Stadium on Friday (April 24). Relay for Life, a fundraising event to help fight cancer, will be held from 6 p.m. to 6 a.m. “Hope Year” refers to the event’s 25th year. The event will also consist of a “fight back ceremony,” a luminaria ceremony, Ms. Relay Pageant and The CC Cross Band. The 12-hour walk is symbolic of the journey a cancer patient goes through, according to Stephanie Buck, Bearkat event chair. “In the beginning the person is ready and willing to battle this,” Buck said. “Once the treatment begins it gets harder to believe that this will go away and not only are you having to battle against cancer but money/insurance can become an issue, too. “Towards the end of the 12 hours you can start to see the light at the end of the tunnel,” she said. “And finally a few years later you are considered cured." Last year, SHSU raised $12,000 for the American Cancer Society, which helped to provide 826 recovery visits, 98 breast prosthesis, 894 road to recovery trips, 333 wigs and 146 ostomy orders. This year’s goal is $15,000. Honorary survivors will speak during the event and teams will have booths with food and baked goods, with proceeds benefiting the cancer society. In addition, SHSU will honor cancer survivors during a banquet on Thursday (April 23), at 5 p.m. at Magnolia Lake, located at 2001 Highway 30 East in Huntsville. Participants may register the day of the event, and while there is no fee to participate, donations are accepted for the ACS. For more information, contact Vicki Barrilleaux, with the Sam Houston State University Colleges Against Cancer, at 936.294.3758, or to register, visit www.relayforlife.org/samhoustontx. The Honorable Bill White, mayor of Houston, will visit the SHSU campus on Tuesday (April 21) to talk with the Bearkat and Huntsville communities as part of his bid for U.S. Senate. The campaigning event, hosted by the Bearkat Democrats, will be held at 7 p.m. in the Criminal Justice Center’s Kerper Courtroom. During the event, White will discuss his decision to run for the U.S. Senate and why he feels he should be given the opportunity to represent the Texas Democratic party, according to Caleb White, Bearkat Democrats president. “Our first goal would be to keep the Democrat students of Sam Houston aware of what is happening in the realm of Democrat politics in Texas,” he said. “Second is to warmly welcome Mayor White to our campus and allow for as many students as possible to meet and voice their concerns to him. White is running for the seat currently held by Kay Bailey Hutchison, whom he believes will vacate to campaign for the gubernatorial race against Gov. Rick Perry, according to an article posted on his Web site. For more information, visit the Bearkat Democrats’ Web site at www.bearkatdemocrats.com. The Student Advising and Mentoring Center will provide Bearkat parents with some finals relief by offering free childcare on May 5-6. The program, designed to give students who have children study time for their final examinations, also will provide a quiet study place from 4-7 p.m. each day. Childcare will be provided for children ages 6 months to 12 years. Children will be watched by student volunteers who will undergo a background check, and a professional staff member also will be there at all times. Parents will be able to study in the Study Skills Classroom, and their children will be in the next room with the volunteers. Parents who are interested in participating must pre-register children by April 27 and sign a participation agreement with all of the program guidelines. Students who would like to volunteer may also sign up with Harris. Volunteers will not be involved in hot food service, diapering/toilet training, or discipline issues and must attend a mandatory orientation meeting that lasts about 30 minutes. For more information, contact Harris at ceh021@shsu.edu or 936.294.4628 or visit the SAM Center, located in College of Humanities and Social Sciences Building Room 170. Brian Loft, assistant professor of mathematics, will discuss some of his personal experiences on Wednesday (April 22). The Student Advising and Mentoring Center’s “Up Close and Personal” lecture will be held at noon at the Farrington Pit. "I want to make sure that students realize that mathematics is more creative than what most of us, including me, learned in high school," Loft said. " It is a beautiful subject that isn't really a science and wouldn't be considered an art by most artists. "I also hope to dispel some of the rumors that mathematics is boring and that mathematicians are stuffy and nerdy," he said. "OK, some aren't nerdy." Loft, who is in his fifth year at SHSU, earned his bachelor’s degree from Louisiana Tech University, his master’s degree from Southwest Texas State and his doctorate from the University of Oregon. His areas of research interest include differential topology/geometry. Rune stone expert Richard Nielsen will introduce the runic alphabet and discuss the three most important runes—Heavener, Kingigto ssuaq and Kensington on Wednesday (April 22). The lecture will be held at 3:15 p.m. in College of Humanities and Social Sciences Building Room 252. Nielsen has written and researched rune stones for 25 years and has contributed to the better understanding of the three most important runes, according to assistant professor of German James Frankki. Runes are letters that were used to write Germanic languages in the first and second centuries, according to Wikipedia. Nielsen holds a Bachelor of Science degree from the U.S. Coast Guard Academy; two master’s degrees, one from the University of Michigan; and a doctorate from the University of Denmark in Copenhagen. He has supervised engineering projects on offshore oil and gas facilities all over the world and is currently working with a professor at Uppsala University, Sweden, who has recently identified new runes. Frankki and his class will visit the Heavener rune stone in Oklahoma on April 23-24. The event is sponsored by the SHSU Society for Norse History and Culture. For more information, contact Frankki at 936.294.1442 or jlf017@shsu.edu. Tianjun Li, a postdoctoral research associate at Texas A&M University, will discuss "D-Brane Model Building in String Theory " on Thursday (April 23). The physics colloquium lecture will be held from 3:30-4:30 p.m. in Farrington Building Room 101. The College of Education will honor more than 100 of its students with scholarships and awards during its 31st annual ceremony on May 1. Scholarships and “outstanding student” awards will be presented from 5-7 p.m. in the Lowman Student Center Ballroom. Earlier in the afternoon, scholarship donors will have the opportunity to visit with each other, as well as College of Education faculty members, during a donor tea. The meet-and-greet event will be held from 3-4 p.m. in Teacher Education Center Room 153. For more information, contact Jenny Estrada, COE secretary, at 936.294.1148. The department of theatre and dance will present an adaptation of the Tony award-winning musical “The Secret Garden” Wednesday through Saturday (April 22-25). Show times are at 8 p.m. each day, with a Saturday matinee, at the University Theater Center’s Mainstage Theatre. Directed by SHSU theatre faculty member Maureen V. McIntyre, “The Secret Garden is based on Frances Hodgson Burnett’s famous 1909 children’s novel of the same name. In the classic story, Mary Lennox is forced to move into a cold, bleak manor with her uncle Archibald after her parents die of cholera. While exploring her uncle’s property, Mary discovers a long-abandoned garden, and, with the help of her friend Dickon, she replants and releases the magic of the garden, bringing joy back in her life and into the lives of all who live at the manor. “The Secret Garden” stars Melissa Joiner as Mary, Justin Finch as Archibald, and Michael Prescott McClure as Dickon. The cast also includes musical theatre majors Christopher Amaya, Eric Aultman, Dana Carlson, William Dehorney, Dominic Di Felice, Sofia Mendez, Amanda Neely, Drew Prince, Katie Rhoades, Cole Ryden, Paul Sanchez, Joe Shepherd, Christina Stroup, Madison Turner, Rachel Weiser and Joel Wood, as well as theatre majors Shannon Holt, Addison Roush and Katie Stefaniak. The musical director is theatre faculty member Laura Avery, dance faculty member Jonathan Charles is choreographer, and Craig Brossman is the technical director. Other technical designers include faculty members Kristina Hanssen, costumes; Gregg Buck, set; and Eric Marsh, lighting. Tickets are $12 for general admission and $10 for SHSU students and senior citizens. Group rates are also available. For more information, call the theatre department at 936.294.1339. The SHSU School of Music will host performances by the symphonic band and the electronic music class on Tuesday and Wednesday (April 21-22). That day, the symphonic band will “bring a variety in sounds and color” to the audience during a concert at 7:30 p.m. in the Criminal Justice Center’s Killinger Auditorium. Under the direction of assistant professor of music Alfredo Vélez III and graduate assistant Debra Vandergriff, the concert will feature two pieces by British composers, Gordon Jacob’s “An Original Suite for Military Band” and Malcolm Arnold’s “Prelude, Siciliano and Rondo,” as well as the famous “Florentiner Marsch” by Czech composer Julius Fucík and an original composition, “Symphony for Winds and Percussion,” by composer Luigi Zaninelli. Admission is $10 for adults; $5 for seniors, non-SHSU students and children over the age of 12; and free for SHSU students. On Wednesday (April 22), the electronic music class will present late-night “Imaginary Landscapes.” The concert will be held at 11 p.m. in the Recital Hall. Composed of mainly middle-to-upper level music students in the Music 473 course, the works that will be performed were generated from a variety of sources, and “through a great creative effort and experimentation by the students” using computer software, according to John Crabtree, adjunct professor of theory and composition. The School of Music’s faculty quartet will bring some “Fire, Brimstone and Brahms” to the Recital Hall to kick off two weekend performances starting Saturday (April 25). The concert, featuring violinists Naomi Gjevre and Javier Pinell, violist Lisa Burrell and cellist Daniel Saenz, will be held at 7:30 p.m. The quartet will perform classical pieces by Wolfgang Amadeus Mozart and Johannes Brahms, the latter of which will be accompanied by pianist Sergio Ruiz. Admission is free, though donations will be accepted. On Sunday (April 26), SHSU’s new contemporary music ensemble, Intersection, will do “some pretty unusual stuff” during an improvisation session at 7:30 p.m. in Music Building Room 202. “Contemporary improvisation is a completely different experience than playing in band or orchestra, where the musicians' parts are written for them,” said composer and music faculty member Brian Herrington. “The players in Intersection have to create music off the tops of their heads, listen to one another intently, and react to one another very quickly. It's really a completely different type of music making than you'll find anywhere on campus. The experimentation comes in how the musicians work with one another, such as in “Owl and the Moon,” for which the ensemble will improvise music as a narrator reads the story of the same name. Intersection will also perform a piece created by the group entitled "Rituel Gagaku," for which the ensemble is divided into several small groups around the room. “We explore spatial effects, which give the audience an almost stereophonic experience,” he said. “It's the most experimental piece we're doing in the concert and might be the most fun." Admission is also free for this concert. 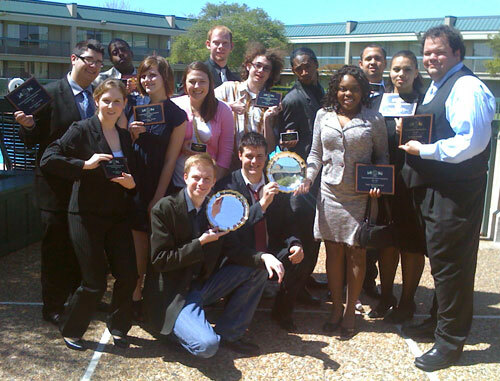 The SHSU Debate Team recently completed an “amazingly successful” season their first year back in competition, ending with a fourth place national finish. The team competed in 10 International Public Debate Association tournaments and won three tournaments, amassing 70 individual and team trophies, according to College of Humanities and Social Sciences dean John de Castro. Individual debaters Clayton Goss and Adesuwa Omoruyi ended the season ranked nationally No. 5 and No. 8, respectively. The team coach is Adam Key. Sam Houston State University’s team from the Division of the Vice President for University Advancement won three awards at the 2009 CASE District IV Conference, held April 4-8, in Oklahoma City. Three different areas of the University Advancement division were recognized with Achievement Awards. The Office of Alumni Relations received the award in the “Alumni Program, Project or Special Event” category for the 2008 Distinguished Alumni Gala. Brigitte Peres, Alumni Relations special event coordinator, submitted the entry. The University Advancement office received the award in the “Development Projects and Special Events” category for the 2008 Samuel Houston Society Dinner. Darlene Andrews, director of donor relations, submitted the entry. The Office of Communications received the award in the “General News Writing” category for the article entitled “SHSU Announces New Forensic Science Facility.” Julia May, assistant director of communications, submitted the entry. Headquartered in Washington, D.C., with offices in London and Singapore, CASE is a professional organization for advancement professionals at all levels who work in alumni relations, communications, fundraising, marketing and other areas. The organization has 22,500 members from more than 3,400 colleges, universities, independent elementary and secondary schools, and educational associates in 61 countries. CASE is one of the largest nonprofit education associations in terms of institutional membership, serving more than 60,000 advancement professionals on the staffs of its member institutions.